The results speak for themselves: at a body weight of only 181 lbs., Peoples was deadlifting well over 700 lbs. back in the 1940’s! No one else could touch him, Bob Peoples was undoubtedly a man ahead of his time. What is also interesting is that Peoples did not have fancy equipment of a complicated training program. He trained mostly by himself in his basement gym primarily with homemade equipment which consisted of wooden 2x4s, 55-gallon drums, concrete, scrap iron, and anything else he could get his hands on. 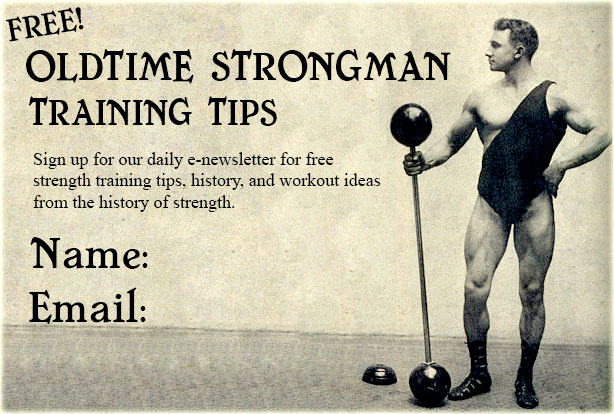 To give you a few good examples, Peoples was one of the first lifters to successfully implement negative-style training into his routine and he pioneered the use of the power rack. Fortunately for us, in 1979, Bob put pen to paper and wrote down many of the things he learned over the years which helped him build his great strength the result was Developing Physical Strength, which is certainly one of the most unique training courses of all time. Peoples was the mentor to a young Paul Anderson, so you know he is a man whose methods are worth studying. Now this modern classic is available once again to help you kick start your routines. 50 pages, 6 x 9 glossy cover paperback and highly recommended for the rare pictures and diagrams alone. These are the actual training methods of one of the strongest men who ever lived — right from the man himself — and this book simply must be a part of your training library!